Research has found Wormwood (Artemisia Absinthium) to be extremely potent against Candida Albicans. Medical herbalist Gerald Green tried many well know anti-Candida remedies on his patients and found them all to be relatively ineffective compared with Wormwood. This valuable herb has been used for thousands of years. Its qualities are related to its anti-parasitic action, which includes effective use in many types of worm infestation (hence the name). Maintenance use: 1 Capsule 3 times daily before food. Adults under 7 stone not to exceed the maintenance use levels. Traditionaly used in the treatment of Candida Albicans overgrowth. Please click here to view the complete Candida Albicans article. This valuable herb has been used for thousands of years. Its qualities are related to its anti-parasitic action, which includes many types of worm infestation (hence the name). 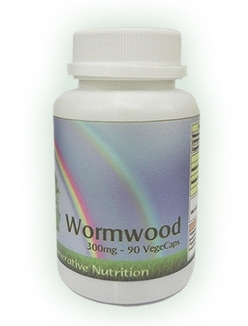 There are other parasites that Wormwood can be effective against, including Malaria. The related herb Artemisia Annua (not supplied by Regenerative Nutrition) has proven effectiveness against Malaria too. Both plants contain Artemisinin. This substance has proved to be a dramatically effective anti-malarial. Artemisinin is the anti-malarial substance isolated in China in 1972 from a shrub, it is used in traditional Chinese medicine from which qinghaosu is derived. Clinical trials have shown it to be 90% effective and more successful than standard drugs. In a trial of 2000 patients, all were cured of the disease. Wormwood has been used in a wide range of conditions. As a bitter herb it is useful in stimulating appetite. (It finds a use in the treatment of Anorexia in this respect). Invigorates and stimulates the whole digestive process. Helps with indigestion, when the cause is insufficient digestive stomach acid. Wormwood is 100% natural and has no side effects, however a couple of days after starting use, most people will suffer from something called Herxheimer's Syndrome. They feel exhausted, and some have headaches or other minor symptoms. This is caused by the rapid reduction of Candida Albicans (die-off). This usually only lasts 1-3 days, after which one will suddenly feel a lot better, and will continue to improve quickly. Even though it is not pleasant it is, in effect, a very good sign that shows that the body is responding to treatment. Wormwood can be used in conjunction with pharmaceutical medication as it is 100% natural, and induces the body to heal itself. However, most of these pharmaceuticals are lactose based, and will therefore feed Candida. Wormwood would probably be less effective. Alcohol should be avoided at all times whilst using Wormwood.